Two sides are notched out to accommodate cups with handles and glasses. Aplastic-coated steel spring clip grips tubular furniture, wheelchairsand beds. 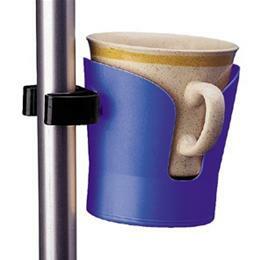 The holder is 2 3/4" inside diameter at the bottom and tapersto a large opening at the top.